I've given the home page at www.mathmammoth.com a "lift" (new design)... go check it out, see if you like it! Currclick has 8 + 2 freebies just for today (Cyber Monday)! One of them is a physics book... I'm downloading it right now. Remember also Math Mammoth Thanksgiving sale... all my products are 25% off at Kagi store. See my website for details. 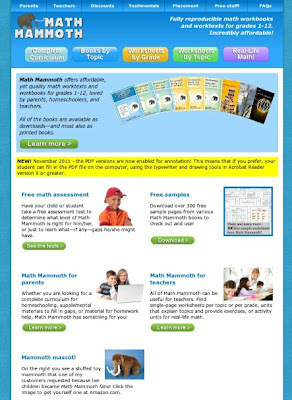 Click here to read a bunch of recent Math Mammoth reviews, by TOS review crew. "My daughter took a break from her other math curriculum and began focusing just on fractions with the Math Mammoth blue series which includes explanations. About three weeks later she was able to test out of an entire text on fractions"
"And I started this school year completely stressed about what to do with math. So finding out I'd be reviewing Math Mammoth again this year was a gift from God." I'm just spreading the word on an upcoming film about homeschooling. The movie is called Class Dismissed. It does sound interesting, though I cannot be sure what all it will include. 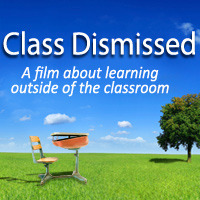 Class Dismissed will be the first full-length documentary devoted to exploring homeschooling as a viable alternative to traditional schooling. As homeschoolers ourselves, we are constantly reminded by the degree to which the public misperceptions of homeschooling are far removed from reality. With this documentary we hope to both educate the general public as well as inspire the existing homeschool community. 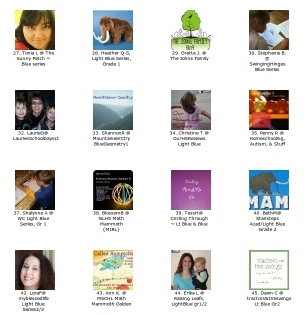 I intend to publish several of these "stories" or "reports" from teachers who have been using Math Mammoth. Here's the first one, from Megan in Belgium. She used some lessons from my Math Mammoth Geometry 1 book. LexxLearn is a new company and is offering afree math assessment test online. It's currently based on Massachusetts standards but is surely useful if you need to benchmark your student, wherever you live. The grade levels offered are from grade 3 through grade 10. Each grade level test has about 35 questions. You will need to supply your email address and create a password, which will then allow you to come back and continue the test at a later time. What fraction of the elephants is blue? 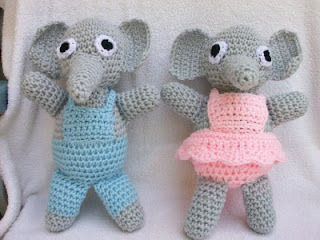 Image courtesy of Wednesday Elf - Mountainside Crochet Bob went to the zoo last week and was captivated by the lovely baby elephants. Some were pink and some were blue. When he counted the elephants, he found that the number of pink elephants was 2 1/2 times the number of blue elephants. What fraction of the elephants was blue? First of all, think: which ones are less, blue or pink? Clearly, the blue ones are less. Make those kind represented by ONE BLOCK or one unit. So, let's let the BLUE elephants to be |----| (one block). Now, to get the fraction asked, I could use those little dashed lines in my blocks... See, I made each block have 4 little dashes ---- and the half-block has two.